It's Monday once again -- the day we share the CSA Share Ninja Rescue, a weekly feature in which you tell me on Fridays what veg you got in your CSA share box (or found at the farmers' market) that you don't know what to do with and I'll give you a whole bunch of recipe ideas on the following Monday. While I am still desperately waiting for tomatoes to start flooding the farmers' markets, beans are more than plentiful. Speaking from experience, there are only so many times your family will tolerate dinner with a side of steamed green beans before crying uncle. So this week we've got some fun and creative ways to use 'em up. Peach and green bean pasta: A seemingly odd combination but a wonderful summery dish -- trust me! Green beans with salumi vinaigrette: Veg meat charcuterie? I'm all in. What did you get in your CSA box or pick up at the farmers' market this week? The Ninj wants to know. I'm doing a lot more canning this summer than in past years. 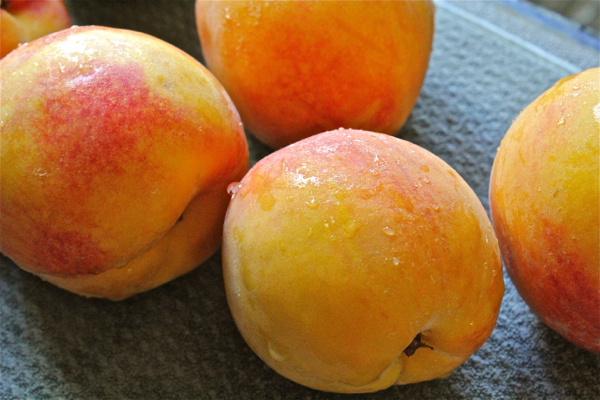 Partly because the wee orchard has finally started bearing fruit (thank you, fertilizer) and partly because I'm cooking along with Sherri Brooks Vinton's Put 'Em Up Fruit as part of the From Scratch Club's virtual book club. I'm jammin' up some chutney in the kitchen and Mr. Ninj comes into the house from the garage. Mr. Ninj: "Wow, it smells good in here. Whatcha making?" Me: "Yes. Orange human chutney. It's like Soilant Green but much tastier." Dudes, I am never that quick with a witty comeback! 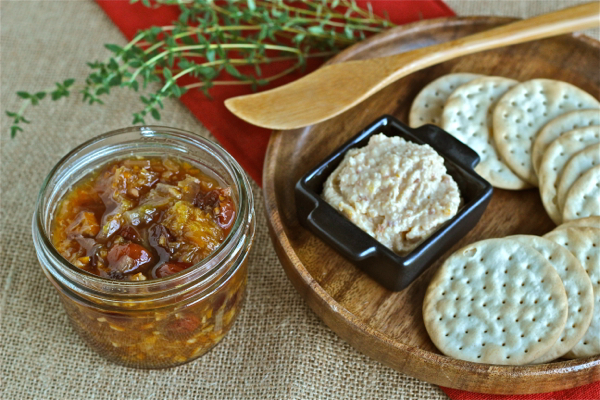 So of course we now refer to it only as Orange-Human Chutney. (Sorry, Sherri.) 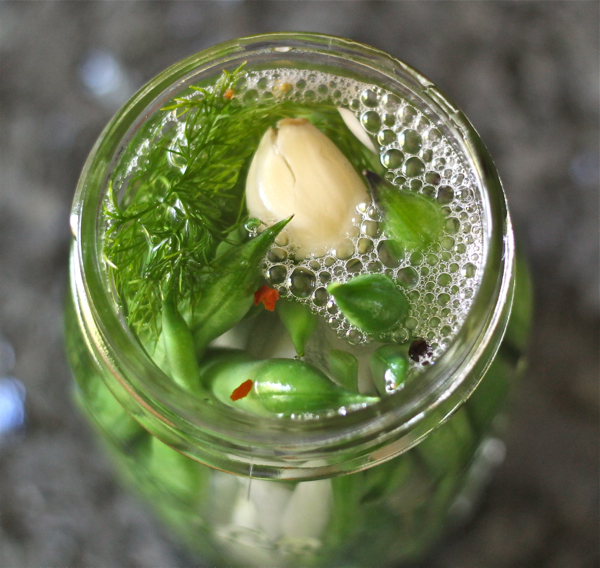 I usually make jar labels for my canned goods: I can't wait to make that one. This is my first-ever giveaway and I'm very excited! Being all ninja-like, this is a different kind of giveaway. Many bloggers are contacted by a brand and agree to write a post on the brand's behalf in exchange for merchandise to give away to their readers. Not so with The Ninj. 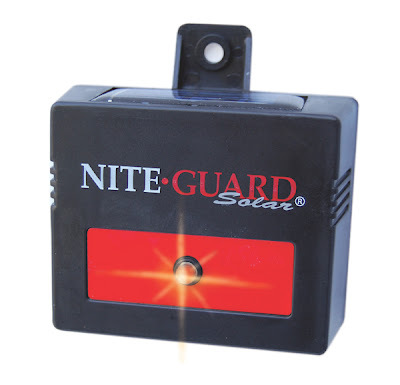 I contacted Nite Guard directly because I already own and love their pest-deterrent product. Let me tell you about it -- and then you can enter to win it! Regular readers are used to hearing about my ongoing battle with the deer and the bunnies in our garden and wee orchard (they like fruit and veg as much as much as we do, apparently). Since both the garden and the orchard are situated in the front of our house, I'm loathe to put up unsightly fencing around them, so I'm always on the lookout for non-fence alternatives to keeping the critters away from our plants. Two years ago, I decided to try the Nite Guard Solar "predator control system" (doesn't that sound badass??!!!). If you're not familiar with this product, it's a solar-powered unit, pictured above, that automatically delivers a single flash of red light each second from dusk to dawn. Nocturnal animals think it is a blinking eye (from up to 500 yards away), a potential threat to be avoided. It also has the added benefit of being mistaken for some kind of security camera on your property, thus discouraging potential human trespassers. One great feature is that Nite Guard Solar is effective against animals of various sizes: bunnies, raccoons, coyotes, deer -- even hawks and owls. The key is to position the units at the eye-level of the animal you are trying to deter. For example, since bunnies and deer are our biggest concern, I have my units positioned at two different heights. Weatherproof and solar-powered, the units require no attention from us other than repositioning. You see, even the silliest deer will stop believing that the flashing light is a threat if it never changes position. So every two weeks or so, I move the lights to a slightly different location (I mount them with zip ties, so they're easy to remove and reposition). And they have worked -- with no fencing required. That's exactly why I decided to contact Nite Guard for my first giveaway. 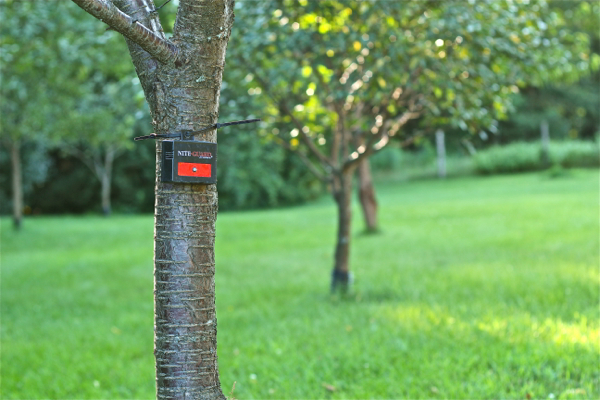 I wanted to share this easy, safe, effective method for protecting the garden with my readers, and the Nite Guard folks have graciously agreed to supply one lucky person with FOUR (4) Nite Guard Solar units, which normally retail for $19.95 each! All you have to do for a chance to win is leave a comment below, telling me what kinds of critters are bothering your garden and if you have any proven tricks or tips for deterring them. Entry for the giveaway ends at 11:00am East coast time on Tuesday, July 30, 2013. Any comments left after that time will not be included in the drawing. Only comments left in response to this blog post will be considered valid entries (talk it up on Facebook, by all means, but that won't count as an entry, nor will an email). Only one comment per individual will be considered in the drawing. One comment will be chosen at random (using random.org) as the winner. The winner will be notified via the email address provided when the comment is left (so be sure yours is accurate) and also posted on the blog after confirmation. The winner will need to respond and supply me with a mailing address within 48 hours of notification, which will then be shared with Nite Guard LLC. The four units (average retail value of $79) will be sent to the winner directly from Nite Guard LLC; The Ninj is not responsible for prize fulfillment. The giveaway is open to residents of the United States and Canada only, please. Of course, if you'd rather not leave it to chance, you can purchase your own Nite Guard Solar units right away! Happy Monday -- the day we share the CSA Share Ninja Rescue, a weekly feature in which you tell me on Fridays what veg you got in your CSA share box (or found at the farmers' market) that you don't know what to do with and I'll give you a whole bunch of recipe ideas on the following Monday. This week we're pleasing both coasts: west coast readers want help with an overabundance of peppers and peaches (we're jealous here in Vermont!) and east coasters have a glut of gorgeous green basil. Basil jelly: Gorgeous color and delicate flavor -- so unique! Peach cobbler: Described by one of The Ninj's followers as being "like angels are feeding you clouds of peach-flavoured unicorn tears." With an endorsement like that, how could you not try it? What's going on in your garden? Do you have tomatoes yet? Leave a comment: The Ninj wants to know. It's Monday, which means it's time again for the CSA Share Ninja Rescue, a weekly feature in which you tell me on Fridays what veg you got in your CSA share box (or found at the farmers' market) that you don't know what to do with and I'll give you a whole bunch of recipe ideas on the following Monday. I'm jealous of those south of me who are already enjoying tomatoes and corn. I am salivating just thinking about it. Here in Vermont, we're still so water-logged that the only thing that I seem to be growing is fungus. 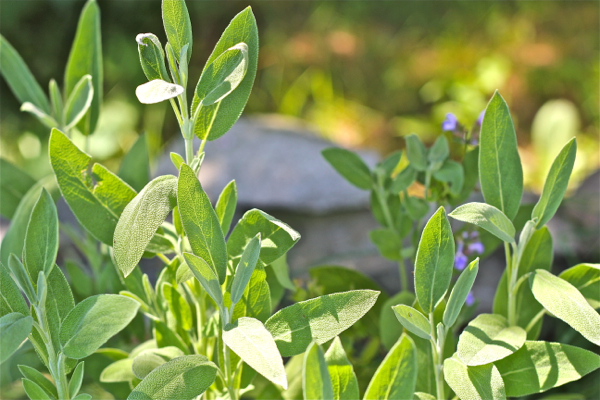 However, my herbs are doing well, as they are for my readers, who this week have requested ideas for using up copious amounts of lavender, rosemary and sage. Blueberry lavender vodka spritzer: What luck -- it's blueberry season right now, too! 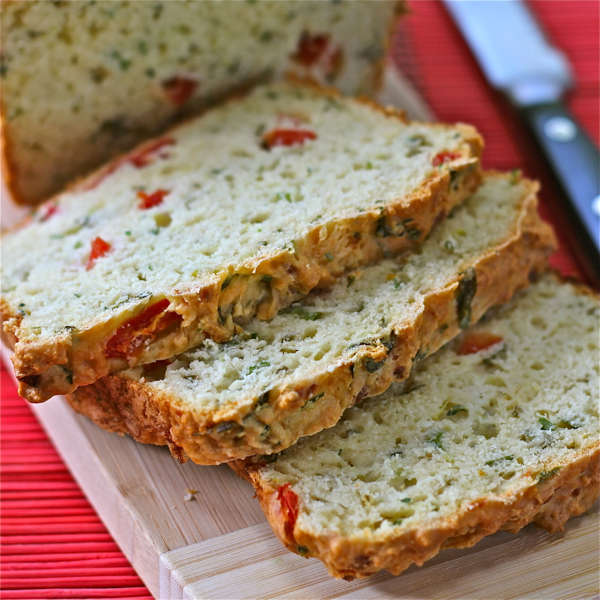 Rosemary bread: An aromatic cheese bread -- yum! Polenta with roasted corn and sage: Again, how handy that corn is coming into season now! What's coming in right now in your garden? The Ninj wants to know. Remember wine spritzers? Basically a glass of wine watered down with some club soda? Yeah, I know I just made them sound lame and gross, but I for one enjoyed them in the hot summer months. They were light and refreshing, so I never felt that I was overdoing it by having more than one. But really, they were still just watered down wine. Not anymore. 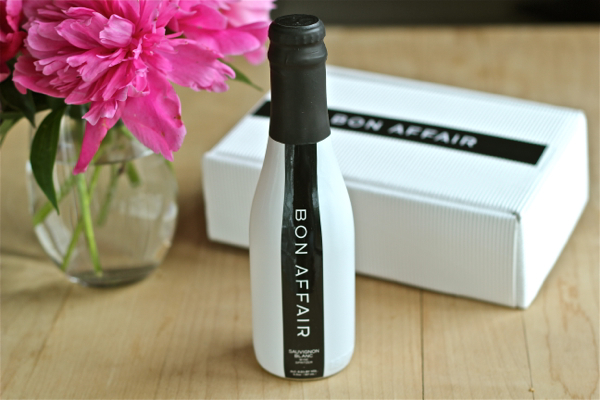 Behold the new Bon Affair wine spritzer: top-shelf, all-natural, ready-to-drink. Bon Affair is California wine (either Sauvignon Blanc or Syrah) blended with carbonated water, electrolytes and grape seed extract, and no added sugar or sweetener. I went crazy for this idea when I first heard about it. It's so smart -- so smart I wish I had thought of it. 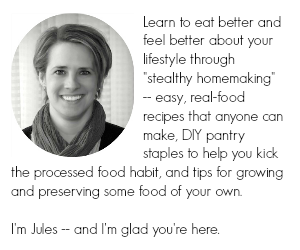 With less alcohol than wine and served well-chilled, it's the perfect drink for summer -- or, as founder Jayla Siciliano cleverly points out, "a long wedding or a night out before a big day of work." OK, sure, you're probably with me on the concept -- but I bet you're wondering how it tastes. I wondered, too, which is why I tried it. Verdict? Crisp, refreshing and, thankfully, not at all like the DIY wine spritzers of my 20s. If you like the fizziness of prosecco and champagne, you'll love these. I'm hooked -- Bon Affair is my new go-to summertime drink. Do or did you drink wine spritzers? Would you be willing to give a more quality version of the spritzer like Bon Affair a try? Leave a comment: The Ninj wants to know. This week: The Chive Five! So far this summer, my readers have been looking for unusual ways to use some standard veg -- to add a little variety to their vegertoires, if you will (heh). Case in point: chives. We're all familiar with the typical ways to use this member of the onion family: as a garnish, mixed into mashed potatoes, as a topping with sour cream for a baked potato. And, of course, you can use them in any dish in which you want only mild onion flavor. But if you want to be all ninja-like in the kitchen, how about trying something a little different with that fat bunch of chives? 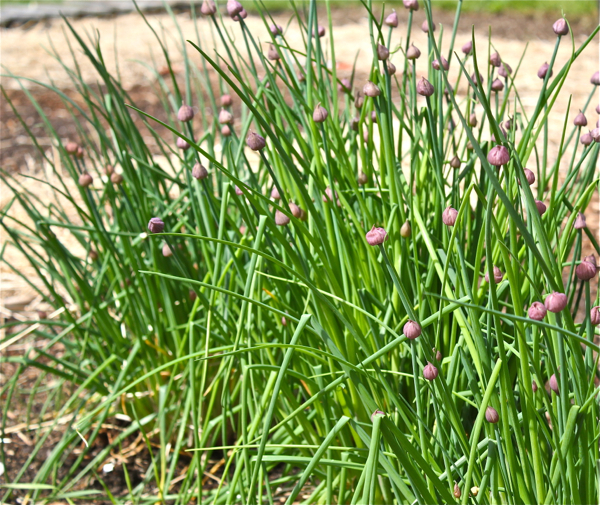 Do you have any other suggestions for using chives? Or do you need help with another type of veg? Leave a comment: The Ninj wants to know. I need you to make me a promise. Right now. You must promise me that you will make this cake as soon as possible. It is imperative that you promise me this because, if you don't, your life will not be complete. Mr. Ninj described it as "better than restaurant-quality"; I'm calling it my new go-to dessert. But wait -- there's more: it is ridiculously easy to make. How easy? Well, can you boil water and use a spoon? Then you are imminently qualified to make this cake. I'm participating once again in the From Scratch Club's virtual book club; currently, we are cooking from Sherri Brooks Vinton's Put 'Em Up! Fruit. 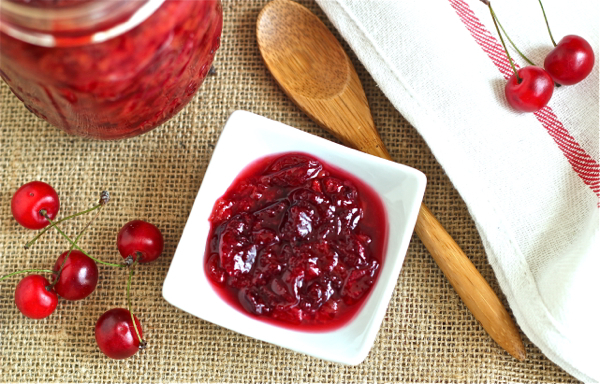 Every two weeks, the group is assigned a different seasonal fruit or group of fruits to preserve (put 'em up) and then incorporate into a recipe (use 'em up). And we share our results with the rest of the group (and I, with you). Our first fruit group was strawberries and rhubarb, the classic early-summer duo. I decided to cheat a little bit and use my roasted strawberry-rhubarb jam, since Sherri's book included recipes both for strawberry-rhubarb jam as well for roasted rhubarb (which was very similar) -- and I had already made a bunch of jars of my jam. 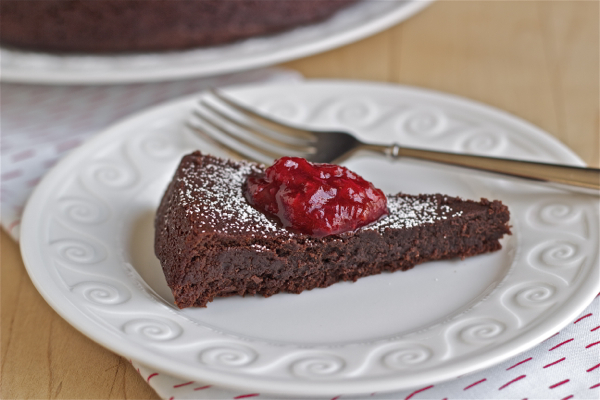 Lucky for you, one of Sherri's suggested recipes for using the jam was this flourless chocolate cake (topped with the jam). 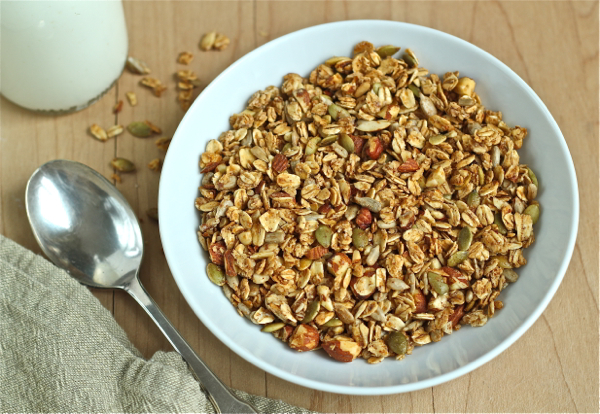 Frankly, I tried this recipe because I was pressed for time and happened to have all the ingredients in my pantry, but it turned out to be an excellent choice. Welcome to another installment of the 2013 edition of CSA Share Ninja Rescue, a weekly feature in which you tell me on Fridays what veg you got in your CSA share box (or found at the farmers' market) that you don't know what to do with and I'll give you a whole bunch of recipe ideas on the following Monday. Apparently, the zucchini giant has awoken. I'm still waiting for mine but my readers are already drowning in it. Additionally, other readers are looking for different ways to deal with an excess of beets and fava beans. Sauteed zucchini: This one is simple and comes to you courtesy of my cousin, Susan -- a little side dish her mother, Anna, created to use up zucchini. Add some olive oil to a pan, throw in some minced garlic and shredded zucchini. It tastes almost like broccoli. Beet bread: ZOMG, it's pink bread! Your kids will flip! Fava bean burgers: Says the creator, "If a samosa and a falafel had a burger baby, this would be it"
And don't forget to check out my rescue posts from 2011 and 2012, too, for even more ideas -- we're in our third year of this, after all!